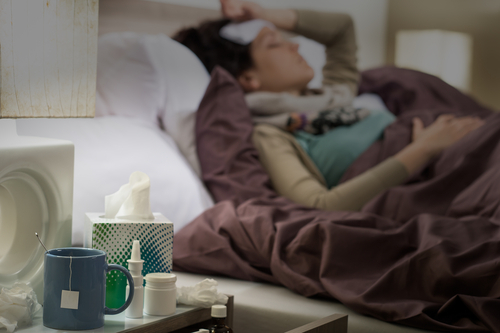 The snow has come and it’s now definitely winter, and that means one thing for Canadians from Vancouver Island to the Atlantic coasts of Labrador: it’s flu season. Nobody enjoys the coughing, sneezing, fevers, and general yuckiness that comes with being sick. Canadians wants to avoid the flu, and the first step is knowing what makes you sick in the first place: a virus. A virus is a little piece of DNA that can override your cells. Your body is constantly generating strands of proteins and hormones to get messages around. When you have a virus, the virus tricks your cells into replicating copies of its DNA instead of those proteins and hormones. Each of those copies can then go on to trick more cells until you’re stuck feeling miserably ill. The reason why there’s such a vicious flu season in Canada is that once it begins to get cold, everyone spends a lot more time inside in close quarters — perfect for a virus to spread from one person to the next. So what can you do? is one of your biggest protectors against illness. Viruses often get onto your body when you touch a contaminated object or shake hands with someone who is ill. Then, when you eat, touch your mouth or eyes, or otherwise touch your face, the virus can jump from your hands and begin to make its way into your body. By washing your hand frequently and striving to not touch your face, you can break down this transfer of the virus from hands to body. The best way to remember to wash your hands is to work it into your routine. Try to wash up before cooking. And when you go to the washroom for any reason, take a moment to soap up. We know that you’re adults, and you don’t get pee on your hands, but wash ‘em anyways! Despite myths about catching the flu from going out into the cold underdressed, the flu is a virus. You can only catch it from other people who are already sick. When you see people feeling under the weather, try to keep a healthy distance away from them. You might also benefit from using some germaphobic tools like not touching anyone, wiping off anything you borrow or lend out, and washing up often. Remember that normal soap and hand cleaners are perfectly good at keeping you safe from viruses. Viruses and bacteria aren’t the same thing. They aren’t even related, and antibacterial products aren’t going to protect you any better, but they do lead to bacteria resisting our antibiotics faster. Whenever possible, avoid soaps and other cleaning products that say antibacterial on the label. These products just mean that when bacteria make people sick, we might not have the medicines to fight them off. Many Canadians are eligible for free flu shots! Some provinces, like Alberta, even offer free flu shots for everyone, while other provinces, such as Quebec, offer free flu shots to high risk groups like pregnant women, the elderly, and children. Anyone else seeking a flu shot is asked to pay a nominal fee. Flu shots contain a tiny bit of the flu-causing virus as well as other ingredients that work to activate your immune system and help your body to easily defeat the virus in the shot. Flu shots are self-defence lessons for your immune system! The next time your body finds the virus, it can destroy the problem before you even get sick! Keeping you and your family safe from the flu is a lot of work. It means knowing how people get sick and how to avoid viruses. It almost means understanding that some things that are marketed to help us stay healthy — like antibacterial soaps — actually make problems worse. If you want to do your duty to help keep your family and community healthy, book an appointment to get your flu shot today!